Use your chemistry to make a fizzy, scented bath bomb (bath ball). Make them for yourself or give them as gifts! It's pretty easy to make and takes only about 15 minutes! Fizzy bath bombs or bath seltzers are an example of an acid-base reaction. The citric acid (weak acid) and baking soda (sodium bicarbonate, which is a weak base) react together to release carbon dioxide gas. This gas forms the bubbles. The citric acid and baking soda don't react until they are in an aqueous (water-based) solution. The cornstarch helps keep the bath bombs dry until you add them to the bath. You could substitute Epsom salts in place of the cornstarch if you prefer. Mix all dry ingredients (citric acid, cornstarch, baking soda) in the bowl. In a different bowl or a small cup, mix the vegetable oil, fragrance, and coloring together. Slowly incorporate the oil mixture into the dry ingredients. Mix well. Place 1" balls of the mixture on waxed paper. They will be semi-hard within 2-3 hours, but allow 24-48 for them to fully dry before storing them. 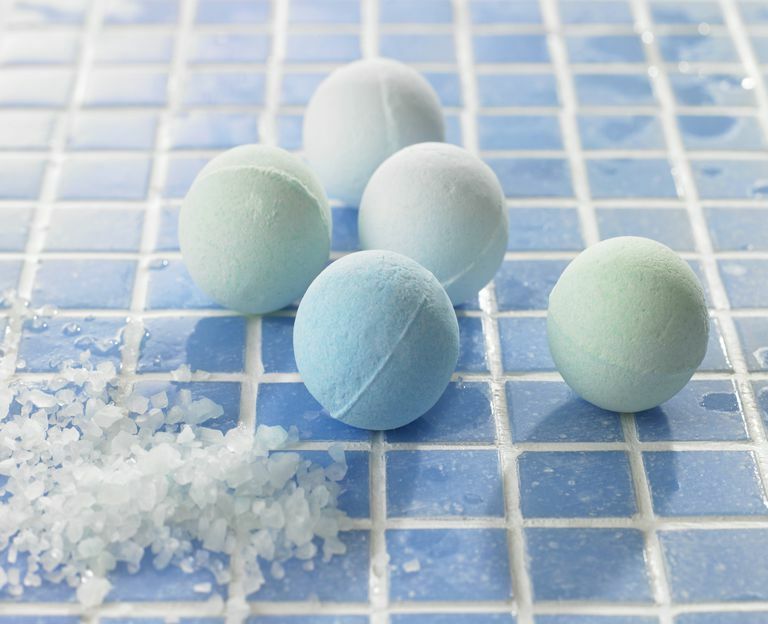 Store bath balls in a sealed container, away from moisture. Add a few to the bath and enjoy! For gift giving, the balls may be placed in individual candy cups. Either fragrance and/or coloring is optional. Suggested vegetable oils include coconut oil, avocado oil, apricot kernel oil, sweet almond oil, or olive oil, although any emollient oil is good! Use small molds to make three-dimensional fizzy bath shapes.